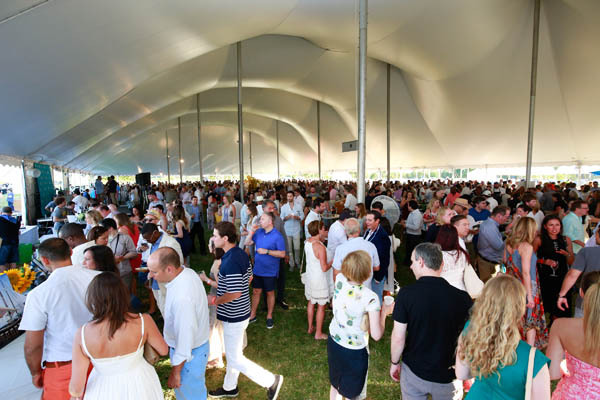 One of the gastronomic highlights of the Hamptons’ whirlwind of summer soirees was the 26th anniversary of the James Beard Foundation’s Chefs & Champagne bash held in Bridgehampton. 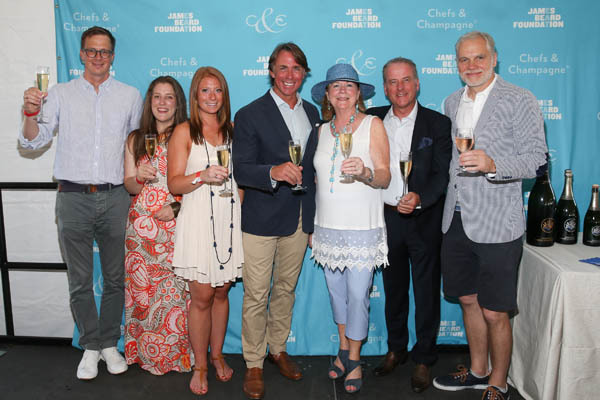 New York, NY (July 25, 2016) – On Saturday, July 23, the James Beard Foundation toasted Daytime Emmy and multiple James Beard Foundation Award–winning chef, author and restaurateur John Besh at its 26th annual Chefs & Champagne®. 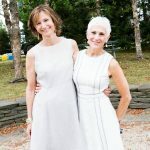 Besh, who also founded the John Besh Foundation, was toasted by more than 1,000 guests who attended the sumptuous benefit at the Wölffer Estate Vineyard in Sagaponack, New York. The Foundation’s tasting party and fundraiser featured flowing Champagne Barons de Rothschild, wines and ciders from Wölffer Estate Vineyard, and delicious tastings from a select group of more than 40 chefs. 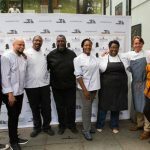 The James Beard Foundation’s Chefs & Champagne® is considered to be the East End’s premier culinary summertime event. A silent auction consisting of fine-dining experiences, wines and spirits, cookware, and culinary travel packages raised over $75,000 to support the Foundation’s mission, educational and Impact Programs which include the annual Food Conference and Leadership Awards that help promote a better food system. Carrying on its long tradition of supporting culinary education, the James Beard Foundation was proud to announce Evelyn Q. Grant as the recipient of the 2016 Christian Wölffer Scholarship and the ICC Intensive Sommelier Course tuition waiver. 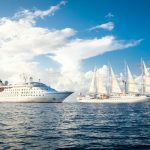 Established in 2006, the Christian Wölffer Scholarship assists students in their study of food and wine. Also in attendance was multiple James Beard Foundation Scholarship recipient Christina Cassel. 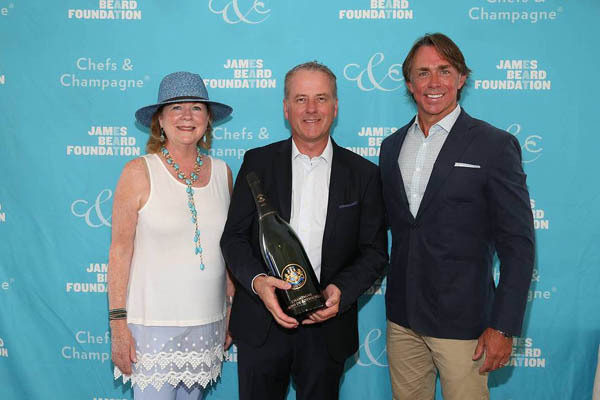 As Chefs & Champagne’s guest of honor, John Besh joined the ranks of gastronomic giants such as Carla Hall, Martha Stewart, Thomas Keller, Wolfgang Puck, Emeril Lagasse, and Bobby Flay, who have all been fêted at prior events. Celebrated chef John Besh has dedicated his career to the culinary riches of southern Louisiana. 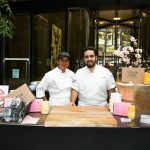 In his restaurants, entrepreneurial pursuits, and public activities, Besh preserves and promotes ingredients, techniques, and heritage one dish at a time. He is the author of four cookbooks: My New Orleans (October 2009) and My Family Table(November 2011), Cooking From The Heart (October 2013) and Besh Big Easy (September 2015); as well as the host of two national public television cooking shows, Chef John Besh’s New Orleans and Chef John Besh’s Family Table. 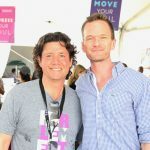 In 2011, he founded the John Besh Foundation, which works to protect and preserve the culinary heritage and foodways of New Orleans via initiatives such as the Chefs Move! 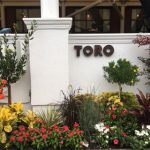 culinary school scholarship and “Milk Money” microloans for local farmers. In addition to Wölffer Estate Vineyard as the host venue, exclusive Champagne from Champagne Barons de Rothschild, VIP after-party sponsor Neuman’s Kitchen, Events & Catering, 2016 event sponsors included Antigua and Barbuda; Audi; Badoit® Sparkling Natural Mineral Water; evian® Natural Spring Water; Goose Island Beer Company; Gokokuya; Hamptons magazine; Maille; Melissa’s; Royal Cup Coffee and Tea; Sturia Caviar; Tito’s Handmade Vodka; VerTerra Dinnerware; and VVH-TV. 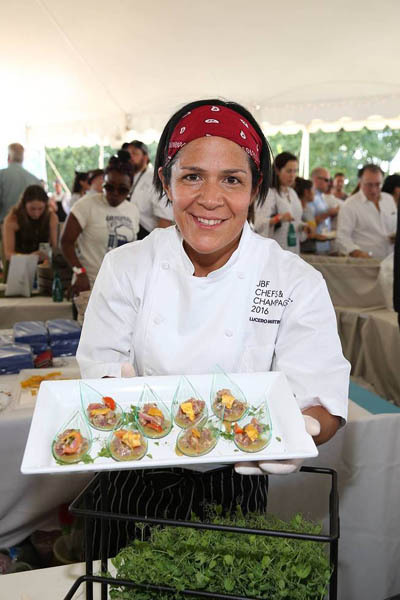 Chef Lucero Martinez serving a Tuna Ceviche with Poblano Peppers and Ginger Marinade at the 26th anniversary of the James Beard Foundation’s Chefs & Champagne® at Wölffer Estate Vineyard in the Hamptons on July 23, 2016. Photo by Mark Von Holden/Invision for James Beard Foundation/AP Images. 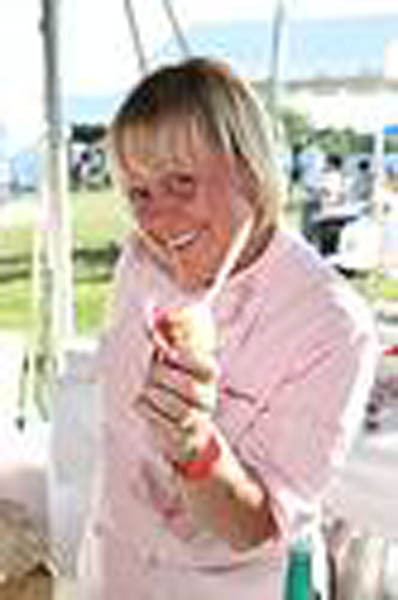 JBF Award-Winning Pastry Chef Sherry Yard offering up her ‘summer in a cup’ White Miso Cone with Sweet Corn and Caviar at the 26th anniversary of the James Beard Foundation’s Chefs & Champagne® at Wölffer Estate Vineyard in the Hamptons on July 23, 2016. Photo by Mark Von Holden/Invision for James Beard Foundation/AP Images. Participating chefs with honoree John Besh and James Beard Foundation President Susan Ungaro at the 26th anniversary of the James Beard Foundation’s Chefs & Champagne® at Wölffer Estate Vineyard in the Hamptons on July 23, 2016. Photo by Mark Von Holden/Invision for James Beard Foundation/AP Images. 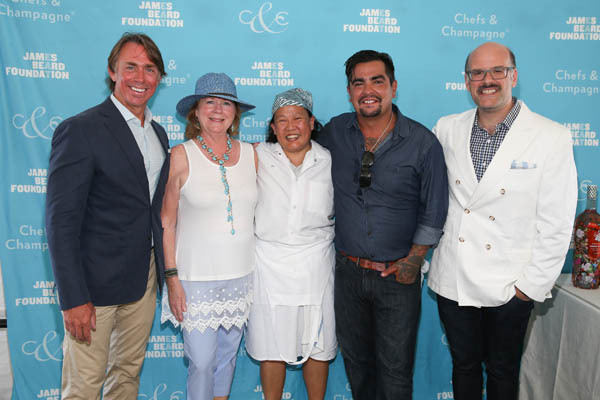 JBF President Susan Ungaro with honoree John Besh and Chef Anita Lo, Chef Aarón Sanchez, and JBF Executive Vice President Mitchell Davis at the 26th anniversary of the James Beard Foundation’s Chefs & Champagne® at Wölffer Estate Vineyard in the Hamptons on July 23, 2016. Photo by Mark Von Holden/Invision for James Beard Foundation/AP Images. 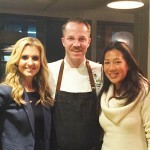 (From L to R) Wölffer Estate General Manager Max Rohn, with James Beard Foundation Scholarship Winners Evelyn Q. Grant and Christina Cassel, honoree John Besh, James Beard Foundation President Susan Ungaro, Champagne Barons de Rothschild Managing Director Frédéric Mairesse, and Wölffer Estate Winemaker and Partner Roman Roth at the 26th anniversary of the James Beard Foundation’s Chefs & Champagne® at Wölffer Estate Vineyard in the Hamptons on July 23, 2016. Photo by Mark Von Holden/Invision for James Beard Foundation/AP Images. 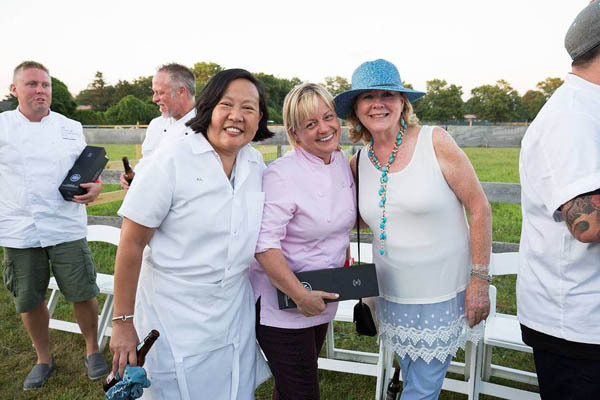 Chef Anita Lo with James Beard Award-Winning Pastry Chef Sherry Yard and James Beard Foundation President Susan Ungaro at the 26th anniversary of the James Beard Foundation’s Chefs & Champagne® at Wölffer Estate Vineyard in the Hamptons on July 23, 2016. Photo by Mark Von Holden/Invision for James Beard Foundation/AP Images. 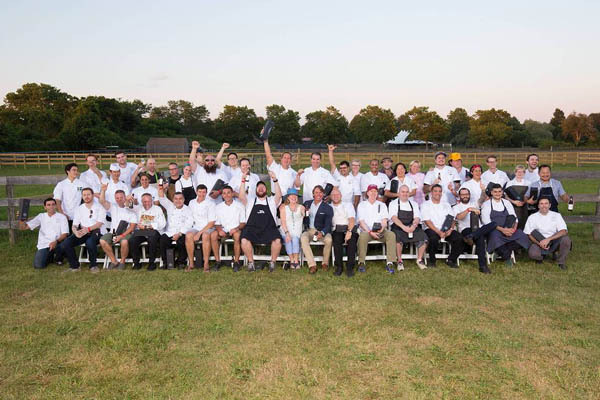 Food-filled festivities taking place at the 26th anniversary of the James Beard Foundation’s Chefs & Champagne® at Wölffer Estate Vineyard in the Hamptons on July 23, 2016. Photo by Mark Von Holden/Invision for James Beard Foundation/AP Images.